Season 3 Teaser Trailer Now Available! Thursday, July 20, 2017, San Diego Comic-Con: Voltron fans were welcomed by the ominous voice of Prince Lotor imploring all enthusiastic panel attendees to take their seats before a screening of the premiere episode of season 3 of the critically acclaimed Netflix original series DreamWorks Voltron Legendary Defender at this morning’s SDCC panel. The 2200 capacity room was filled and the episode screening was met with cheers and wild applause. Executive producer Joaquim Dos Santos revealed that Season 3 will debut on Netflix on August 4th with seven episodes to be followed in October by Season 4 with six more all-new episodes. Dos Santos also announced that AJ Locasio (Back to the Future: The Game, Marty McFly) has joined the cast as the voice of the devious new villain, Prince Lotor. Season 3 picks up in the wake of Zarkon’s defeat and Shiro’s disappearance, as the paladins struggle to move forward with no one able to pilot the black lion or the ability to form Voltron. The team must quickly devise a plan as the ascension of Prince Lotor and his generals pulls the team into a perilous game of cat-and-mouse that tests their unity and abilities more than ever before. 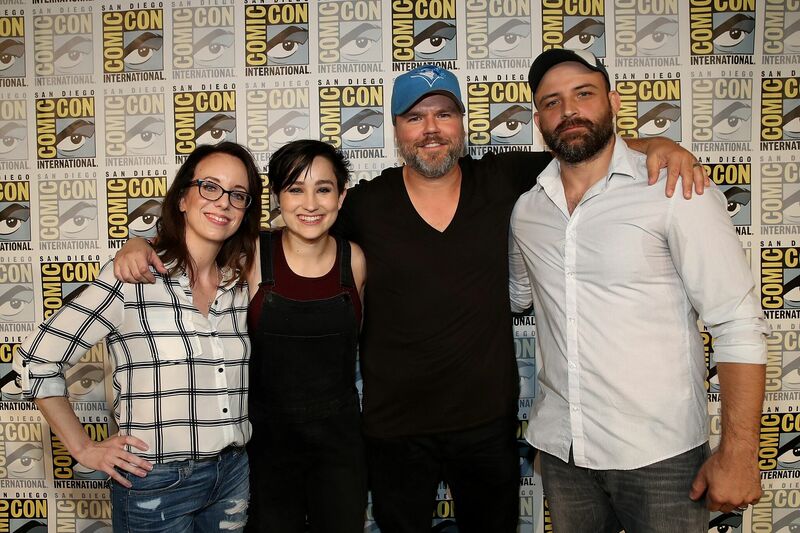 The sneak peek screening was followed by an in-depth discussion of the upcoming season with executive producer Joaquim Dos Santos, co-executive producer Lauren Montgomery, Bex Taylor-Klaus (voice of Pidge), Tyler Labine (voice of Hunk) and panel moderator Kyle Anderson, Associate Editor of Nerdist. Each attendee received a San Diego Comic-Con exclusive poster created by the Voltron crew as well as a copy of “The Rise of Voltron,” a new chapter book from Simon & Schuster. DreamWorks Voltron Legendary Defender season 1 and 2 are currently available on Netflix. Calling all Voltron cosplayers! Thursday is the day to break out your bayards and join Joaquim Dos Santos, Lauren Montgomery, Bex Taylor-Klaus and Tyler Labine at FANDOM Fest to celebrate Voltron with a cosplayer and fan meet up. A DreamWorks Voltron Legendary Defender signing with Joaquim Dos Santos, Lauren Montgomery, Bex Taylor-Klaus and Tyler Labine will take place from 10:30 AM – 12:00 PM on Friday in the Autographing Area located in the Sails Pavilion of the San Diego Convention Center. As Coran would say, “Ahoy, young paladins! I’ve whipped up a big batch of focusing food. After this snack, you’ll be forming Voltron six times a movement and twice on the astral conflux!” Take a break from the crowds and have a cold and refreshing treat on us. DreamWorks Animation Television is bringing every paladin’s (least) favorite snack to San Diego: green food goo! From 11 AM – 6 PM Thursday to Saturday and 11 AM to 5 PM Sunday you’ll find Hunk’s Food Goo Replication Station serving Altea’s finest green goo while supplies last. DreamWorks Animation Television is one of the world’s leading suppliers of high-quality, animated family programming, reaching consumers on linear and on-demand platforms in more than 130 countries and garnering 31 Emmy Awards to date. It is a division of the Universal Filmed Entertainment Group (UFEG).